I had a wonderful conversation with a small cadre of ladies yesterday that has left me pontificating about men, love, life, and relationships—the subjects of our engaging chat. There is hardly a conversation that I’ve been engaged in where the topic of men, love, life, and/or relationships didn’t surface at some point. It doesn’t matter if you are at work, school (and for some of us those two are one in the same), church, at the park, or on the beach, these topics will at some point be in rotation. Does that mean that women have little else to expound upon? I daresay that is true. But I will confess that I never tire of talking about any of the aforementioned topics. Does that make me predictable and/or boring? Perhaps. And I’m okay with that. I’m okay with being a woman and never tiring of “girl talk”. What has stayed with me from yesterday’s conversation is a matter of character. One of the ladies spoke of a rift that had recently come between her and her boyfriend. The two have been in a relationship for the past fifteen months, and as of late, a couple of incidents have forged a gulf between the two of them. This woman, whom I had just met, wasn’t necessarily seeking advice from any of us, and none of us sought to provide her with any relational “pearls of wisdom” to be quite honest. It was more about lending an ear to a sister who was going through an experience (and for a couple of us, a relatable experience). I’ll be the first to admit to never trying to give anyone relationship advice given my history of unsuccessful ventures with men. And quite frankly, that’s what I shared with the woman I met yesterday. I hardly ever feel confident telling another woman what she should (or shouldn’t) do when my relationship report card is full of failures. Nevertheless, we were analyzing the circumstances and at some point I said something to the effect of actions saying a lot about a man’s character. To put this into context, the woman had mentioned that her boyfriend hadn’t really been speaking to her and their living arrangement had begun to be awkward. However, he admitted to struggling with some things internally, but wasn’t comfortable and/or willing to talk about these issues with her. So the woman suggested that her boyfriend talk with her pastor. After some reflection he accepted the offer. And that’s when I made the point about his openness to speaking with her pastor as a positive sign and being a reflection of his character as a man. The fact that he was responsive to talking to her pastor, and had maintained an open line of communication with her, says something about his character—in my humble opinion. And when it comes to finding a mate, character is without a doubt an essential quality (a deal maker or breaker). And as I left the beach I began to think about my series of unfortunate events with the male species. I mulled over one failed relationship after another. I thought about the role I played in those failures. And I came to one conclusion: I want a man who is brave enough (or crazy enough—given one’s point of view) to stick around when the “ish” hits the fan. I think most of us want someone by our side who won’t run at the first sight of turmoil. Personally, I know I give men (friends and lovers) grief because I’ve been trying to find that one man who can handle the heat in the kitchen. I know that I’m far from perfect and will never reach such a state, but I do admit my shortcomings and try not to allow them to rule me. But I am adamant about acknowledging my vices. I am convinced that relationships are work, hard work. Perhaps they are even more work that our jobs/careers. That being the case, I’m okay with that. But I can’t be okay with someone who doesn’t recognize this truism in life and isn’t willing and/or able to buckle down when the storms of life come. All that being said, I’m in search of the man whose character proves that he has staying power—the power and desire to stay around when I get ugly (physically, spiritually, and emotionally—just naming a few here). I’m holding out for the man who realizes that life is about change, and neither one of us will be the same people we are (were) when we first met, but he’s a man who is interested and invested in knowing who I’ll become in a year, a decade, or even longer. I’m waiting on that man whose motto is “I ‘Don’t Quit’!” I don’t know if they make them like that anymore, but there remains a glimmer of hope that he’s somewhere out there, and one day our paths will cross. No woman (and I would presume the same may perhaps be true for men, but I don’t dare assume anything) whose invested time and emotions into a relationship for any extended period of time wants to throw in the towel at the first sign of struggle. If anything, we (the tenacious) tend hold on never wanting to let go even when we know in our heart of hearts when we’ve lost the battle (and perhaps the war). So many of us hope beyond hope that there is chance for redemption—be it our own or our mate’s. We remain hopeful that even when the terrain on the road of life has become treacherous. We don’t want to give up, to throw in the towel. We strive to make it work in the face of imminent failure. But that’s what tenacious men and women do—we try as we might, but we just don’t quit. In closing, I am reminded of a well-known poem I fell in love with as a young girl. While the author remains anonymous, the spirit and message of the poem have become familiar friends of mine. 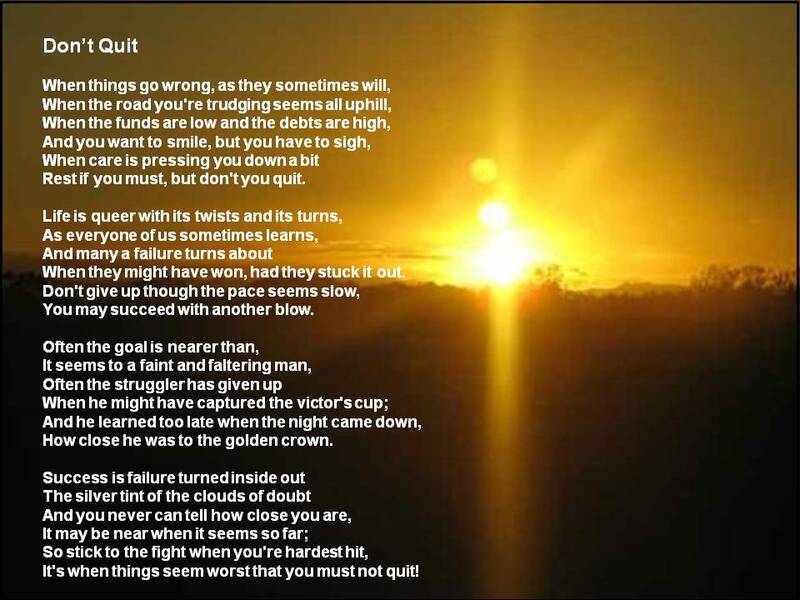 I leave with you the words of one of my all-time favorite poems, “Don’t Quit”.